Yesterday the ultrasound confirmed we are having a beautiful little girl! As you can see she's still tiny at 14 0z. with a heart rate of 140 bpm. 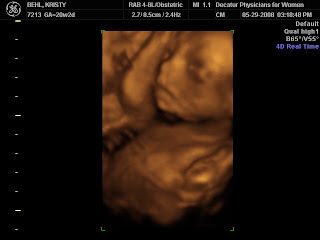 The doc said all of her organs and features are perfect and she's actually a little bigger than average (that's daddy's girl!). I will post some pictures of Kristy next week, she's getting so big. By the way she is 21 weeks on Monday.